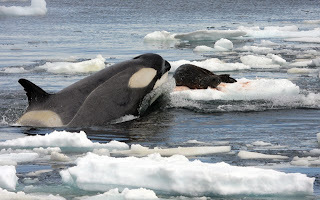 EagleSpeak: If it's not one thing, it's another: "Marine Life gets Drowned Out as Oceans get Noisier"
At the time of Columbus, during the Mideavel Warm Period, there was no year round Arctic Ice Pack. Yet the Polar Bears and whales seem to have survived several hundred years of that. I suspect there are fewer ships sailing the seas than there was right after WWII. When the 1000 foot ore carriers were introduced into the Great Lakes, each one, because of her larger capacity, faster speed, and self unloading gear, replaced 10 old style ore boats. I would think the same would apply to sea going freighters as well. The large ships have huge, slow turning, screws as well, and Diesel powerplants with mufflers, rather than oil power with ventilation blowers screaming away. Could the greater sound level be because we now have better equipment for analyzing the sounds in the oceanic basins?